Right on the heels of the Lueders announcement was another defensive commit in the form of Florida cornerback Lo Wood. The recruiting class of 2010 bumped up to eight when Wood flew into South Bend and announced his commitment at mini-press conference at the Varsity Club Hotel. Here is a clip of that presser where Wood did the hat and shirt announcement game as well as answered a few questions about his recruitment. The 5'11" 167 pound Wood currently is pegged as a 3 star recruit on both Rivals and Scout. As a cornerback, Wood is Rival's 32nd ranked corner and the 42nd ranked corner on Scout. ESPN gave Wood a grade of 78. Those aren't the highest ranks for a corner, but he did have a pretty solid offer list. Runner-up Michigan joined offers from Virginia, Georgia Tech, Ole Miss, Stanford, NC State, and others. And while Wood's combine "measurables" didn't stand out from the pack, he performed well enough at the Jacksonsville National Underclassmen Combine a year ago to win the Defensive Back MVP award. Winning the last positional award of the morning was DB MVP Lo Wood of Apopka High School. Wood (5 feet 10, 162 pounds) showed great explosion to the receiver, and fabulous ball skills and athleticism. During the combine events, he also had a 27-inch vertical, 9'1.5" broad, 4.30 shuttle, 4.58 40, and 10 reps on 155 pounds. The descriptions are sort of reminiscent of Robert Blanton, who similarly didn't wow people with his 40 time or vertical leap, but kept impressing when actual football was being played. The Rivals Florida high school site just released their Top 100 Florida recruits list and put Wood at number 43 with the description "It's hard to argue that Wood isn't the most physical DB in the state". If you're looking to try to figure out just what kind of corner ND is getting, here are his highlight clips. Another bit of good news is that Wood plans on graduating early and becoming an early enrollee at ND. It will be a tad bit of an adjustment to move from the middle of Florida to South Bend in January, but Wood says he's ready. "A lot of schools tried to say it's going to get cold," Wood said. "But if you want to play in the NFL, you've got to go to Green Bay sometimes. And it's going to be cold there, so you better get used to it." Getting back to his homestate, Wood's high school, Apopka High, is a strong team from Central Florida that plays in the state's largest classification. Last year the school produced incoming Michigan freshman Jeremy Gallon and is the alma mater of NFL star Warren Sapp. If Wood can be the start of a pipeline to the school, that would certainly be a good thing. On to the cornerback depth chart. There is definite talent on this table, but not all that much depth. Consider that Darrin Walls could easily declare for the NFL draft after the 2009 season with the depth becoming much thinner. Wood is the much needed first CB recruit in a class expected to land two or three. ND seems to be in a good position with a number of talented prospects, so hopefully filling up this class with freshman ready to contribute right away won't be a problem. The past few weeks haven't felt like the off-season with a steady stream of news, both good and bad. In addition to the Montana/Sharpley/Hendrix/Fauria news, ND picked up another two commits. First up we'll take a look at Thursday's newsmaker Blake Lueders. The defensive lineman from Zionsville, Indiana committed to Charlie and ND two days after visiting campus and became ND's seventh member of the Class of 2010. "I knew when I was there (Tuesday) Notre Dame was the place," Lueders said. "I just wanted to sleep on it and think about it for awhile and make sure I was right. I was. I'm happy with my choice. At 6'5" 250 pounds, Lueders plays middle linebacker for his high school, but is looking like a solid strongside defensive end candidate and possibly even a defensive tackle if he keeps growing. The recruiting sites have him pegged for defensive end with Rivals labeling him a 4-star recruit, the #14 strongside defensive end, and #198 overall recruit. Scout also give Lueders 4-stars as the #18 overall defensive end. ESPN includes him in their currently number-free top 150 watch list. ESPN also has a copy of his highlight clips for those interested. Lueders picked ND over offers from North Carolina, Virginia Tech, Virginia, Wake Forest and finalists Stanford, Northwestern, and Boston College. Looking at the finalists, it shouldn't be a surprise that Lueders carries a 4.0 GPA. Blake, a Class 4a All-State honorable mention player last season, first gained recruiting notice after his sophomore year of high school when he won the MVP at the Indianapolis segment of National Underclassmen Combine. Lueders was the leader of the pack as he was the winner of the MVP award. The 6’5 232 lb Lueders ran an unbelievable 4.3 shuttle, had a 9’10 broad jump, and bench pressed 155 lbs 29 times. Lueders was very impressive. Not to extrapolate too much from an underclassmen combine, but if could put up numbers like that as a high school sophomore, it sounds like Lueders will show up on campus physically ready to go from day one. And that is a good thing, because there will be possibilities for early playing time. Here's the scholarship breakdown for defensive end. There is no guarantee that Kallen Wade will be back for his 5th year in 2010. Ethan Johnson could be a fixture at the tackle spot by then and Nwankwo at 295 pounds is another tackle sized end. That leaves Kerry Neal, KLM, and the freshmen as prototypical defensive ends. Granted, Darius Fleming will still likely be a pseudo-defensive end despite now being listed as a strongside linebacker. Steve Filer might be tasked with rushing the passer from the outside too. But after coming up empty at end in the incoming freshmen class, there will be opportunity for Lueders and Martin to make an early impact in 2010. Hansen's article in the SBT this morning has some bitter quotes from tight end Joseph Fauria, who is transferring to another school in lieu of serving a one-semester suspension for an undisclosed disciplinary violation. ND head coach Charlie Weis, hamstrung from expounding on the subject by a quagmire of privacy laws and strict university policy, signed off on the transfer Friday afternoon and wished Fauria well. "(Weis) didn't want me to leave, and I didn't want to leave, but I felt I had to," said Fauria via cell phone from California as he was driving to the beach to ponder his future. "I didn't want to go back there (to ND) and have to be under the microscope and not be myself. I wanted to have a fresh start. "I can't say enough about coach Weis, tight ends coach Bernie Parmalee, the guy who recruited me — coach Brian Polian — and the players, too. "I know coach Weis can't come out and support me publicly because of protocol, but I know how he feels, and that's all that is important. It was an honor to be coached by him. I love him. I'll miss him. I still consider him a part of my family. It's sad to leave everyone, but I feel I was mistreated by the school and that the punishment didn't fit the crime." Fauria declined to delineate publicly just what he was punished for. Fauria said he'll likely explore a Pac-10 option in order to stay close to home (Encino, CA). In a (premium) interview with Pete Sampson of Irish Illustrated, Fauria had even harsher words for how he was treated, saying it was blatantly "unfair." "They don't take character into account. It's the letter of the law, but not the spirit of the law. It's a Catholic environment, but there's no Catholic spirit in the process, no spirit of Notre Dame. It's all just trying to knock somebody down. It's terrible..."
"If anyone knows me, they know I'm not some malicious person, not some predator. I'm a fun-loving guy. (Residence Life) didn't see that." Fauria also claims he was forbidden to appeal the decision. Unlike the rest of you diligent and pious alums, I cannot quote chapter and verse from DuLac, so I paged through it this morning looking for the "appeals" guidelines. I was surprised to find that ND's disciplinary process only allows for "case reviews", not appeals, and even then only in situations where procedural defect is alleged or new information has come to light. Appealing simply on the grounds of "severity of punishment" is never considered. While this may be a crummy policy, what this tells us is that Fauria's lack of access to appeal probably wasn't out of the ordinary in the draconian world of ResLife. Football-wise, where does that leave us with tight ends? Pat explored this below in greater detail, when the suspension of Fauria was announced. Rudolph is still the clear #1, but now even more responsibility falls on Mike Ragone and his rickety legs to hold down #2. Walk-on Bobby Burger now moves up a notch to #3, and incoming frosh Tyle Eifert and Jake Golic just went on redshirt alert. There is some depth. As my friend Brian said, the loss of Fauria is a setback, but if everyone else stays healthy (and enrolled) it doesn't have to be a crippling one. This should be a tome shorter than the "Famous Jewish Sports Legends" leaflet. In a word: don't. Don't email recruits. Don't call recruits. Don't visit recruits at their homes. All pretty obvious, right? Allow me to add a fourth: do not become Facebook "friends" with or otherwise communicate on Facebook or Myspace with recruits. In a recent interview with Irish Illustrated's Pete Sampson (exempted from this rule: it's his job to serve as a conduit between recruits, the ND staff, and fans), consensus #1 defensive end prospect and current Irish oral commit Chris Martin mentioned he received 243 messages yesterday from purported ND fans, reacting to reports Martin was considering visits to other schools. Apparently, the messages were a mix of the supportive and the angry. Allowing that some, or even many, of these messages could have been written by fans of other programs, with the goal of undermining Martin's relationship with Notre Dame (and there is Facebook precedent for such conduct), none of this is appropriate. First, NCAA regulations forbid written communications between alumni/financial supporters of a school and recruits. Notre Dame's Compliance Office provides simple guidelines, among them an instruction that one "MAY NOT" (in all-caps), "make any recruiting contacts with prospects or their relatives. This includes telephone calls, letters, emails, and facsimiles, along with any face-to-face contact either on or off-campus." Though "Internet social networking sites" are not among the non-exhaustive list, it's a safe bet such communications are within the intended spirit of the rule. I'd rather not find out the hard way. Second, college recruits are, by definition, high school students. Adults should not initiate contact with high school students they do not already know. You should no sooner seek the friendship of Chris Martin or Anthony Barr than you should start emailing out of the blue a random junior at some high school in Dubuque. It's weird, to put it lightly. Third, this brings up a broader point about recruiting. We as fans can do precious little to positively influence the recruiting process. Leaving to the side the issue of whether negative message board discussions of coaches and seasons are appropriate or detrimental, attempts to directly influence recruits will probably not achieve their desired effect. Like trying to mend fences with an ex who has obtained a restraining order, chances are the harder we try, the more likely we are to fail. And when bad news emerges -- and it will, every year for every team -- emoting, like urinating, is an act best done in private. 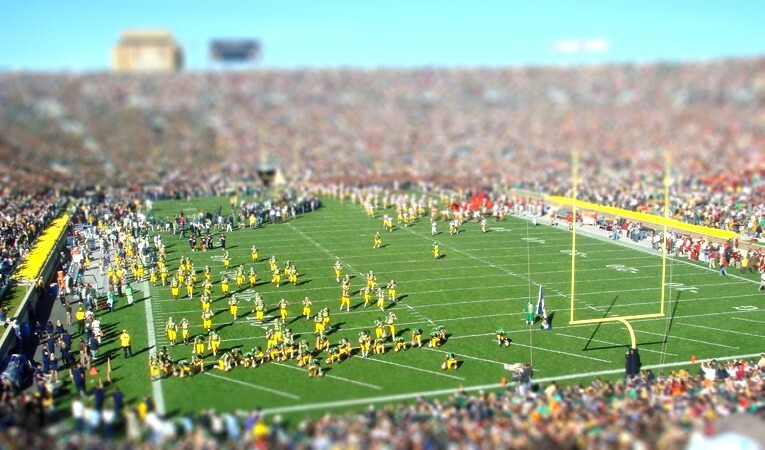 Notre Dame is the subject of several popular message boards, but the ownership of an NDNation or Irish Illustrated "handle" does not mean one cannot instead use tried-and-true methods such as private emails, screaming in a car with the windows rolled up, or throwing a lamp into the wall when bad news hits. Finally, for those of you worried about the future of the Chris Martin-Notre Dame relationship, relax. I think all will turn out fine in the end. Lo Wood just wrote on my Wall and told me so. Back to ND for his second visit of the spring, Hendrix committed to ND and ended his recruitment. "It was really tough," Hendrix said. "(But) Notre Dame is the right place for me in the end and it's everything I want in a school athletically, academically and religiously." Hailing from the one-time ND pipeline Moeller High School in Ohio, Hendrix is the second GCL player to pick ND over Ohio State this year joining Elder tight end Alex Welch. In addition to the Buckeyes, Hendrix has offers from Nebraska, Miami, Michigan State, Tennessee, Boston College, and others. The recruiting sites aren't in complete agreement over the 6'3" 220 pound Hendrix, but these rankings were made before ND and OSU stepped up with offers. It wouldn't suprise me to see Hendrix move up a bit, especially on Scout who has him as a 3-star recruit and the #27 QB in the class. Rivals is a bit more bullish, giving Hendrix a 4-star ranking and slotting him as the #200 overall recruit and #11 pro-style QB in the class. ESPN hasn't assigned a number ranking to Hendrix yet because he's one of their many Top 150 watch list players. But their writeup of him is pretty positive and echoes the underrated theme. Hendrix could be the biggest sleeper in this class not only as a powerful pocket passer, but also as a deceptively good athlete. He possesses adequate-to-good height and a solid build. Arm strength is outstanding and he is one of the few players in this class with natural downfield power and terrific wrist snap and velocity on all throws. Hendrix's highlights bolster the "deceptively good athlete" cliche as he's constantly scrambling for yards and throwing on the run. He sort of reminds me of Crist, in that he's mobile for a big guy and will put his shoulder down and get a few extra yards at the end of the run. Notice only two snaps in the whole 6+ minute highlight reel are taken from under center, so Hendrix will have some adjustment to a more traditional pro-style offense once he arrives in South Bend. Hendrix appears already set on not rushing things anyway. Hendrix said he will likely redshirt the first year and be able to get ahead with classes. He is interested in the medical field. Rivals put together an interesting additional highlight reel/analysis in that it's one of the few times I can remember them showing a QB throw incomplete passes while discussing some weaknesses. On nearly every other QB highlight reel you'll ever see, the QB tends to have a 99% completion percentage. To be honest, it makes for a better analysis in my opinion to show the bad with the good. Like Sharpley, Hendrix might double-dip and play baseball if the stars line up right. Currently, Hendrix is a pitcher for Moeller's state championship baseball team. Hendrix, who is also on the Moeller's baseball team, said he will also consider playing for the Notre Dame baseball team if the opportunity presents itself. He said he's already spoken with Weis regarding that possibility. After not taking a QB last year, ND absolutely needed one in this class and may even see if there is a second interested QB recruit. In the meantime, the 2010 depth chart isn't terribly deep, but assuming Clausen returns for his senior year, there is plenty of talent. Let's just hope Hendrix works out as well as the last Ohio QB recruit. A relatively quiet summer was interrupted with news that sophomore tight end Joseph Fauria won't be enrolled at ND for summer school or for the fall semester. The University put out a release that Fauria won't be around for personal reasons and that Charlie hopes he will return for the spring semester. Fauria was reached and confirmed that the plan so far is for him to return. "I'm just taking it in stride," Fauria told the Tribune on Wednesday night. "The plan is to come back." It's rough news for the Irish offense as Fauria was one of the most improved players in the spring and would be counted on as a steadily improving blocker and 6'7' passing target for Clausen. He had pushed even to Ragone for the #2 TE job and might even have passed him with a strong fall camp. But now Ragone is the solid #2 counterpart to rising star Kyle Rudolph. It might sound like ND will be just fine with the extremely talented Rudolph/Ragone duo at TE. But, as noted in Michael's spring opus, the ND offense works much better when there are multiple legitimate pass catching tight ends on the roster. And given Ragone's two major knee injuries, the more depth the better. So now eyes will turn to transfer-turned-walk on Bobby Burger. Ideally, ND would be able to preserve a year of eligibility for incoming freshman tight ends Tyler Eifert and Jake Golic. If Burger can continue to build on his strong spring showing, then ND will have three competent tight ends and the freshmen can benefit from a year on the sideline. At 6'3" 242 pounds, Burger has the size to contribute and received some positive press from Charlie in the spring when he was still the #4 tight end. Burger started his college career at the University of Dayton, where he was a defensive lineman. He sat out last season to satisfy NCAA transfer rules, but he and then-freshman Jonas Gray were the consistent standouts for the ND scout team in practice against the Irish starters last season. Meanwhile, Fauria hopefully will follow the path of Darrin Walls and Gary Gray, who both missed semesters for personal reasons, only to return back ready to play. The silver lining for Fauria is that he won't lose any eligibility since he played as a freshman in '08 and can use the 2009 as his de facto redshirt year. In the meantime, hopefully the recent ND TE hex will take a breather for awhile and ND can play the 2009 season without having to resort to plugging in reserve offensive linemen in tight end spots. Assuming everyone stays healthy, a depth chart of Rudolph, Ragone, and Burger, not to mention the two freshmen, is still better than what most teams have. Earlier in the year, the Wall Street Journal put out a great article and chart showing the varying experience level of collegiate offensive lines. Echoing the idea behind Ivan Maisel's blurb from last fall, the article mentioned the strong correlation between cumulative offensive line starts and team success. Like many ND fans, I quickly scanned the list and was happy to not only see ND ahead of all opponents, but above every single BCS conference team save Virginia Tech. Here's the the breakdown of ND career OL starts versus the 2009 opponents for those who missed it. But while it's nice to look at a list like this, ND's OL isn't going to face any of these other offensive lines. Knowing that ND's DL is going to be very young this year, there are still a number of veteran OLs they will have to face and attempt to out-play. On the flip side, I was curious. What kind of experience will ND's veteran OL be facing? Will it be up against a steady stream of battle-tested defensive lines that will somewhat negate ND's cumulative playing time? The following is the breakdown of the cumulative starts from the opponent's defensive lines heading into the 2009 season. An important caveat that needs to be mentioned is that defensive lines rotate players far more than offensive lines. So a key player could be a strong contributor, but never be a "starter". Southern Cal's Everson Griffen comes to mind. However, minutes played aren't published by every program, so we'll have to stick with the slightly less exact metric of cumulative team starts. If you notice any mistakes, feel free to chime in with a comment. What do you think? Surprising to see Southern Cal so far down there, but they do have a number of experienced and talented backups thanks to years of excellent recruiting. Michigan's inexperience wasn't really a surprise considering their graduation losses, but they are still pretty low. Even worse for them, Brandon Graham holds 16 of their 17 cumulative starts. Other programs where a single player includes more than 50% of a team's total include Michigan State (Trevor Anderson - 31 of 48), Washington (Daniel Teo-Nesheim - 36 of 60), and Southern Cal (Christian Tupou - 10 of 17). Washington State might have a hard time improving on last season's nation's worst rush defense with only six returning starts. On the other hand, there did appear to be a number of new junior college players making up the depth chart. Without knowing the results from the rest of the nation's DL, it's hard to try and draw too many other hard and fast conclusions from these numbers. On the whole though, I don't see many veteran filled defensive lines on the Irish docket for 2009. What led me to this conclusion was figuring out ND's DL number. I had assumed ND would be near the bottom of the list, but after adding up Kerry Neal's 15 starts, John Ryan's 15 starts (! ), Ian Williams's 8 starts, and Ethan Johnson's 4 starts, the grand total of 42 was higher than I expected. That would land ND right in the middle of the above list. In reality, ND's line that sees the field most often will be slightly younger as Ryan appears to have been passed on the depth chart. But other teams could very well have similar issues. The main takeaway seems to be that there really are no excuses for the Notre Dame offensive line, and by extension offense, in 2009. In addition to their own seniority, there is a lack of veteran laden DL opponents if you consider that ND has more collective starts than half the opponents. Sure, there will be a few rising star types that are tough to handle from the get-go, but overall things really are lining up for a return to 2005/2006 type offensive fireworks. Anything less would be pretty disappointing. Today is the day that the whole team returns to campus for the start of summer classes. All of the freshman are in with the rest of the team showing up during the day. And with this first glimpse of the light at the end of the off-season tunnel, Eric Hansen of the South Bend Tribune offers up two new articles to provide some excellent "we're getting closer to football season" depth chart conversation starters. The first concerns the surprising return of Evan Sharpley for his 5th year. Drafted by Seattle in the 50th round of the recent Major League Draft, Evan worked out a deal with the Mariners to allow him to return to ND early enough to participate in all of fall camp and prepare for the 2009 season.. A successful under-the-radar application for a 5th year option last winter kept this option open. The move gives ND's QB depth chart an instant shot in the arm. Danye Crist is still the expected backup to Clausen, but now the Irish also have a backup who has started a number of games, knows the playbook, and can provide additional team leadership. Some might wonder why Sharpley is coming back to essentially be a third stringer. The answer is he is working towards a goal of becoming a teacher and coach in case his baseball career doesn't take off and will spend the fall fulfilling his student teacher requirements. "I think it's not only going to be great from a player's standpoint, but as a future coach's standpoint as well. I'm going to take advantage of being able to look at what goes into the planning and behind-the-scenes stuff. I owe a lot to coach Weis." Sounds like a win-win situation. Sharpley gets to prepare for his future and ND gets a one-year boost to the depth chart to supplement the talented but inexperienced Crist. The next article by Hansen is a great off-season rundown on some critical Irish players for the 2009 season. But in addition to fluffy tidbits about Brian Smith, Armando Allen, and Duval Kamara staying near campus rather than return home after finals and Floyd, Tate, and Rudolph spending a week out with Jimmy Clausen in California, Hansen offers up some possible position switches we all might see tried out early in fall camp. First, while talking about sophomore guard Trevor Robinson, Hansen notes a few possibilities. The left tackle move was discussed prior to spring ball, but the second is an interesting twist to what was assumed a set in stone starting five. Much speculation in the spring had him [Robinson] popping up at left tackle, but fifth-year senior Paul Duncan’s renaissance spring negated that notion. The two likely scenarios: 1) Robinson nudges past senior Chris Stewart at right guard OR 2) Stewart moves to left guard and incumbent starter Eric Olsen slides over to center, with returning starting center Dan Wenger becoming a backup. I have to admit I'm a bit intrigued by the second option of moving Olsen to center. If the idea is to get the five best offensive linemen on the field, then I can easily see Robinson swapping in for Wenger. There is no doubt the run game would benefit from an interior of Chris Stewart, Eric Olsen, and Trevor Robinson. However, can Eric Olsen play center? It's one thing to try and find the five best overall players and stick them on the field together. It's another to take a lifelong guard and hope he can successfully execute shotgun snap after shotgun snap. If ND were to do the roster shuffle Hansen highlights, that would leave only Sam Young playing the same position he played last season. All of the line's veteran experience isn't going to mean as much if all the players are learning the nuances of their new spot on the line. In the end, it will probably come down to the play of Trevor Robinson early in fall camp. If the coaches decide he's just too good to keep off the field, look for the likely possibility of OL musical chairs. The other depth chart scenario involves the defense and specifically the nickel defense, which will likely be ND's most frequent defense given the pass and spread-offense happy nature of ND's 2009 opponents. Look for [Brian] Smith and Te’o to be the nickel linebackers, safety Sergio Brown the extra defensive back and a surprisingly effective pass-rushing group up front, built for speed. ... Fleming and fellow sophomore SAM linebacker Steve Filer will drop down and play ends, with end Kapron Lewis-Moore and end/tackle Ethan Johnson moving inside. No kidding that front seven will be built for speed. Ends as tackles. Linebackers as ends. The mantra is clearly rush the passer with a lineup like that. The somewhat surprising note is Filer slotted at one of the end spots. He's one of the better athletes on the team, so this lineup is certainly exciting from a pass-rushin', all-out Tenuta blitzin' standpoint. On the other hand, it's a small line that wouldn't hold up to the run much (granted, nickel defenses aren't designed to do that anyway) and there is a whole lot of inexperience when the lineup consists of one senior, one junior, four sophomores, and one freshman. Consider Fleming, Johnson, Filer, KLM, and Te'o have a combined career playing time of 251 minutes, which is exactly what Brian Smith logged by himself last season. And what about Kerry Neal? He played more minutes last year than any returning defensive lineman. Will he be a part of the base defense only and leave the obvious passing downs to Steve Filer? Does this mean Filer isn't expected to start at another linebacker position and will specialize as a pass rusher, ala Mo Richardson? With Te'o rumored to be up to close to 240 pounds already, could he just start at middle linebacker from the get-go in both the base and nickel defense? There will obviously be some shuffling in fall camp as the coaches mix and match their way to a base and nickel defense. The battle for starting spots probably won't be fully decided until a few games into the season either. It sure is nice to have actual competition for jobs with more than one appealing outcome, isn't it? Is it September yet? There was an interview with Jack Swarbrick in the San Antonio Express-News this morning. In discussing the possibility of playing Army on the 100th anniversary of our famous game in 1913, Swarbrick also mentioned that 1913 was the first year that Notre Dame played Texas. Might he be trying to add the Longhorns to the 2013 schedule? Q: There’s been quite a buzz generated in the media since word came out that you were considering playing a game against Army at Yankee Stadium. What did you make of the response? JS: It’s been amazing. We’ve probably heard about that as much as anything. It’s all very positive and people were very excited. There’s a long history there for college football. When the Yankees closed the old Yankee Stadium, in the commemorative book, a remarkable number of pages were dedicated to Notre Dame’s visits there over the years. We’re part of the history there. I read a book recently, that I’m very fond of, called, “Notre Dame: The game that changed college football.” It focuses on the 1913 game with Army where the forward pass came into play. That’s the sort of history you really want to tap in to. We’re about to go into a period of time where we’re encountering a whole bunch of 100th anniversaries. As a matter of fact, (2013) is the 100th anniversary of our (first) game against Texas. Q: As we understand it, there are potentially some financial issues that could hinder you in making the Army game happen in Yankee Stadium. But can you talk about the prospects of a game between Notre Dame and Texas in 2013 — and we’re assuming that would be at one of the two campuses? JS: I’m not really in a position to talk about the prospects of that game in any particular year. What I can say is that we would love to play Texas. We love playing the schools that have had a comparable history. But also that share our values. The rest of the interview is also worth a read, if only to get a sense of what the Washington State game in San Antonio is all about. It's pretty clear from Swarbrick that he thinks it has little to do with athletics, and everything to do with bringing Notre Dame's academic and service presence to the city. At one point, he even discards the "it'll help in recruiting Texas" angle. Q: You’ll be coming into these areas to showcase the university. But you’ll also be coming into some prime recruiting areas. Can you talk about the benefits from that standpoint? JS: It’s not much of a motivating factor. We’ve always been able to recruit nationally, moreso, frankly, than any program in the country. That’s the history of this program. I don’t know that we get any particular recruiting advantage by taking a game into a community. Note that "regional recruiting advantage" was one of the supposedly key reasons cited by Kevin White when he sought out these neutral-site games. Swarbrick just deep-sixed that pretense. The truth is, as Swarbrick says (and as we noted back in February), these games are about the social service projects, the educational seminars, the Notre Dame Masses in San Antonio -- in short, everything about Notre Dame but football. The two teams down there on the field blocking and tackling each other were, for White, simply a marketing tool, and the off-site venue was a way to wring an 8th NBC broadcast out of a 12-game schedule. Although Swarbrick indicates that he's continuing to explore the neutral-site games, he's at least paying attention to the quality of potential opponents and/or matchups of historical significance. Signing a contract with Texas would be a nice reminder that we're here to play football, not just sell T-shirts. Meet Bennett Jackson, Notre Dame's fifth public commit of the 2010 recruiting class. The New Jersey wide receiver announced his decision this past Sunday. "I just really liked Notre Dame a lot," said Jackson, who visited Notre Dame May 23. "When I went out there, I felt really comfortable with the coaches and the players. There wasn't anything bad or negative I can think of. Notre Dame just had all positives." Jackson announced his decision at halftime of Sunday's New Jersey vs. the Northeast All-Star Football Classic at Rutgers Stadium. Jackson had the option of making his decision on live television, but declined out of respect for Rutgers, which had recruited him. The second wide receiver commit in the class, the 6'1" 165 pound Jackson seems destined for a role as a slot receiver, where being shifty outweighs pure speed or height. He's mentioned in recent media articles as a receiver/return man, so ideally he will contribute as a punt or kick returner as well. The recruiting sites are somewhat lukewarm on Jackson. Rivals lists him as a 3-star recruit and the 57th overall ranked WR recruit. On the other hand, it sort of sounds like they might bump him up a bit as this recent video mentions that Bennett "blew up late in the process". (yes, June before your senior year is now officially late in the recruiting process...go figure). Scout is a bit more positive, tabbing Jackson as a 4-star recruit and the 25th overall WR recruit. ESPN gave Jackson a 77 rating and slightly positive review. Overall, Jackson shows flashes of becoming a polished player with good consistency from play to play. Explosive speed is an area where he may find it more difficult at the next level to have an advantage, but he does many things well and he is comfortable in many roles. Comfortable in many roles seems to summarize his versatile play in high school. There is a lengthy 10 minute highlight reel on youtube for those wanting to make their own analysis of his play. As for his track results, he recently placed 6th in the state in the 110m hurdles with a time of 14.4 seconds. Other than ND, Jackson had offers from Michigan State, North Carolina, Pitt, BC, Rutgers, Iowa, and a number of other programs. With Jackson in the fold, here is what the WR depth chart will look like in 2010, his freshman year. We'll try to start including position specific depth charts with each commit post so everyone has a good idea of just where ND is thin or deep for the coming seasons. Caveats: Seniors and juniors with asterisks next to their name have an additional year of eligibility....For all of these depth charts, all 5th year players listed are those with the potential to come back, even though it's not expected that every player with eligibility will be back...These depth charts can change at a moment's notice due to injury, position switches, or ResLife. I've just spent a few minutes jotting a list of the scheduling news & rumors we've heard in the past few months. Here's the executive briefing. 1. On the possible Miami series, the latest update was in April. Although Heisler poured cold water on the idea, Miami AD Kirby Hocutt is keeping hope alive. Speaking of down the road and opportunities, Hocutt seemed more confident there could be a future meeting with Miami and Notre Dame than with the Canes and Gators, who are currently scheduled to meet for the last time in football at Dolphins Stadium in 2013. "If there is any way whatsoever to get [a series with Notre Dame] done, we'll get it done," Hocutt said. "I don't want to lead people on or sound too optimistic, but there has been an initial phone call and another conversation through a mutual relationship [TV]. There's definitely interest on both sides. If it's something we can get done in the future it sounds like we're both committed to it." 2. They may play football at Yankee Stadium again, and Swarbrick wants them to put the Irish on the docket. This is a great idea, and probably deserving of its own blog post (or three) just to explore the history of Notre Dame, Army, and football at Yankee Stadium. 3. An Army series was confirmed ('twas already rumored), to start in 2010. This could be a candidate for a Yankee Stadium game. Seems like a game in 2013 would make sense given the 100-year anniversary of the 1913 ND-Army game. 4. In late May, rumors of a possible Wisconsin series surfaced. Wisco AD Barry Alvarez hinted at Notre Dame scaling back its Purdue commitment with the Badgers to potentially fill the gap. According to Alvarez, Notre Dame officials are revamping their annual series with Big Ten Conference member and longtime rival Purdue. Instead of facing the Boilermakers every season, Notre Dame would like to face Purdue every other season. When Alvarez spoke during a clinic at Notre Dame earlier this spring he informed Notre Dame athletic director Jack Swarbrick that UW would be interested in filling the vacancies. 5. Purdue, contradicting Alvarez's comments, said they have no intention of putting the ND series on hiatus. Purdue athletic director Morgan Burke said he's in discussions with Notre Dame athletic director Jack Swarbrick about extending the series past 2015. The Boilermakers and the Fighting Irish have played every season since 1946. "Jack and I are talking about how to take that further," Burke said. "There's been a lot of speculation about four (years) on and two off. All I'm going to tell you is it's speculation. "I marvel at the reports that are out there. We would like to find a way to continue it." 6. And in fact, Swarbrick just yesterday confirmed that we're trying to keep the Purdue series up and running without interruption. For those thinking the Purdue-Notre Dame game might end up taking a hiatus or changing its format, think again. Swarbrick said Friday he’d like to continue playing the Boilermakers, the Irish’s only in-state football rival, on a yearly basis. Neither Swarbrick nor Purdue athletic director Morgan Burke said a deal to continue the series has been formalized. “The Purdue series is really important to us,” Swarbrick said. “The number of things I’ve been doing in scheduling, I’m trying to make sure we’re very mindful of our history and tradition here. When others in the Big Ten wouldn’t play us, Purdue would back early in our history. There are only 3 open dates. They are all late-season. We have four road games scheduled (@ MSU, BC, Navy, USC). It's doubtful we would add another. My guess: look for two one-off home games (similar to the Army and Duke filler games of '06-07) to be inked for 2010. Finally, here's a comment to consider, from Purdue's AD Burke, in the article above. Former Notre Dame athletic director Kevin White altered [Notre Dame's] scheduling policy before leaving for Duke in 2008. White's plan was for Notre Dame to play seven home games, one off-site game that is considered a home game and four away games each season. White's preference was to protect rivalries with Southern California, Navy and Michigan. "Before Kevin White went to Duke, he had a strategy he was employing," Burke said. "That may not be the same strategy that Jack Swarbrick is working with." Burke hints at something that I've noticed, too. Apart from confirming the Army series, there haven't been any official scheduling changes emanating from Swarbrick's office since he took the job. There is no doubt, however, that the rhetoric has changed. We've gone from flatly refusing to entertain ideas from other schools, like Alabama, to actively engaging them. There seems to be a new openness, and a willingness to explore new possibilties. (To get a fuller sense of the shift, hit that link; you'll see what the White mentality looked like in the summer of 2007. "There just isn't much wiggle room," he lamely claimed). Swarbrick is at least talking as if he isn't handcuffed in the same infuriating way that White always did. Let's hope the action will match the rhetoric. Just toying around with a website that allows you to simulate miniature photography. Got a ND photo that might look cool in mini? Link it in the comments and we'll give it a whirl.